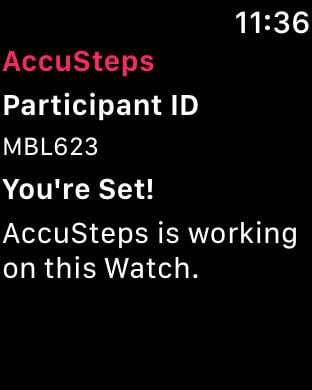 AccuSteps is an Apple Watch app that tracks and provides feedback on daily step count. It is part of a research program aiming to improve tracking accuracy and user experience of wearable activity trackers, led by the Stanford Human Computer Interaction Group. AccuSteps records step count and other activities, heart rate, and calories burned. AccuSteps queries various metrics about your health data from HealthKit. These metrics, which include step count, running distance, heart rate and exercise time are used strictly for the purposes of our research. Your health data is automatically collected and analyzed by Stanford's trained researchers.